We’ve decided to save cash by eating in on Friday nights. The rule is that we have to do something fancy, so that we don’t feel cheated out of restaurant-standard food. It also must be a recipe that will teach us both something new. On this occasion I really wanted duck. And Duncan wanted something Oriental. So this recipe satisfied us both. Buying duck breasts in a supermarket isn’t easy. While they have chicken breasts of every shape and provenance, duck is limited to whole birds, crowns, legs or ready-sauced, ready-to-rip-you-off packs that don’t welcome your own flavours. So we bought a Gressingham crown – pricy but great quality – and Dunc had a bash at jointing off the wings and removing the breast meat from the carcass. New skill number one! I’d figured the giant Clapham Junction Asda was bound to have Szechwan pepper, not just because most larger London supermarkets stock a huge range of ethnic products, but also because of its middle-class catchment area. They stocked it alright, but it was sold out!!! Obviously Szechuan is very vogue right now. But never fear, Waitrose to the rescue. The duck recipe is from Donal Skehan’s cookbook, Kitchen Hero; you’ll find it at the end of this post. We were organised enough to give the duck a decent amount of marinating time in its lovely sticky aromatic glaze. I think this is really quite essential as the flavour needs to permeate the meat. When we put it in the oven, we poured the remaining marinade over it in the roasting tin, but next time I would save this and bubble it in a pan to reduce into a sticky sauce. You live and you learn. Dauphinoise potatoes definitely aren’t Oriental but they go amazingly with duck so I couldn’t resist. I’m an old-timer with them, so didn’t bother with a recipe, just layered up potato slices, thyme leaves, garlic, salt and pepper, boiled up the dregs of some double cream with milk and ground nutmeg and poured it over. No cheese on top, as the cream is naughty enough already and Christmas is a-coming. 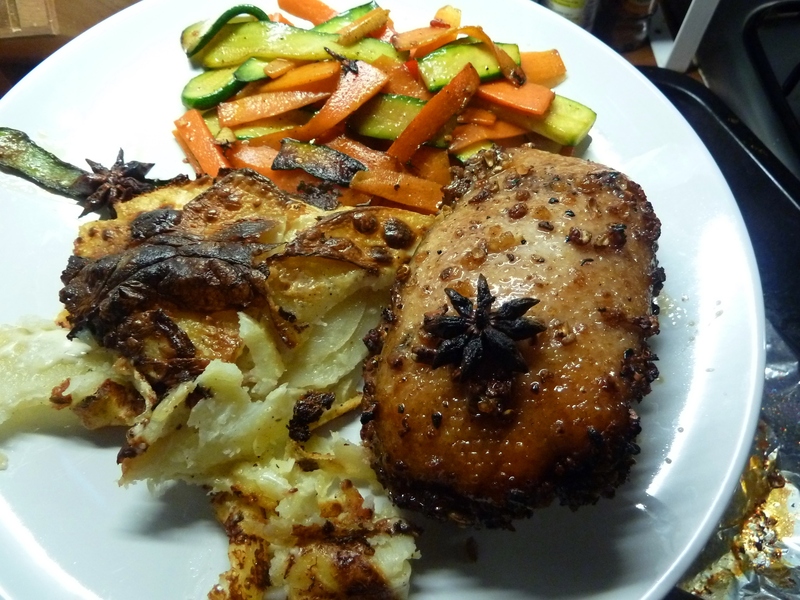 With aromatic duck and rich potatoes, my plan had been for simple veg. Thin strips of carrot and baby courgette, with just the tiniest touch of fresh ginger. It would have been the perfect foil. I gave Dunc instructions and… turned my back. That’s when he snuck two red bird’s-eye chillies, seeds and all, into the wok. Bad boyfriend! ABSOLUTE DISASTER! Szechwan pepper is a subtle flavour, wonderfully grown-up and aromatic. Hot red chillies massively overpower it. One mouthful of veg and I couldn’t taste a jot of my duck. So the veg got scooched off the plate and I went without my five-a-day. Duck got saved. Boyfriend got chastised. Please, please, please, nothing spicy or strongly flavoured with this delicious dish. In a bowl, mix the soy sauce, honey, rice wine, garlic, Szechwan peppercorns and the crushed star anise together until combined. Add the duck breasts to the mixture and toss until completely coated, then cover and place in the fridge to marinate for at least 2 hours, or overnight if you have the time. Allow to come to room temperature for 10 minutes before cooking. Preheat the oven to 200°C (400°F), Gas mark 6. Place the duck in a roasting tray and scatter in the extra whole star anise. Cook in the oven for about 15 minutes until cooked all the way through. Baste the duck with the juices halfway through the cooking time. When the duck is cooked, preheat the grill to high then place the tray under the heat for 1–2 minutes to caramelise and crisp the skin. Allow to rest for 5 minutes before cutting into thin slices and serving with a drizzle of the juices. 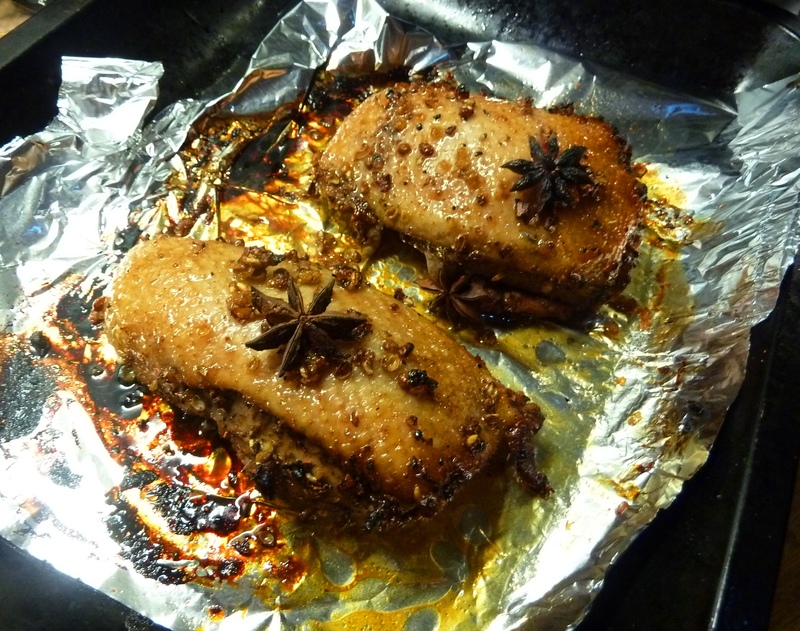 This entry was posted in Around the world, Dinners, Recipes and tagged Chinese, duck, food & drink, recipes by ionelou7. Bookmark the permalink. I absolutely love duck and can’t wait to try this wonderful sounding recipe. Thanks for the inspiration.